First, thanks to all our bloggie buddies for rallying to Write a Post and Help a Dog. Thanks to all of you, we collectively wrote 149 blog posts about the Pedigree Foundation which resulted in a donation of 2,980 pounds of Pedigree dog food to shelter dogs who need it most. Woo Hoo! #BloggersRule! But that's not all! Now, Mars Petcare US is increasing the donation to 27,000 pounds of dog food (that's no typo!) to help shelter dogs in areas impacted most by Hurricane Irene. Mars Petcare will donate the food to RescueBank -- a national pet food distribution organization working to get dog food to where it's needed most in the Albany, New York area. And, as a way to thank everyone who participated and anyone who wants to help a shelter dog, you can still purchase Dogs Rule gear at a discount at dogsrulegear.com. 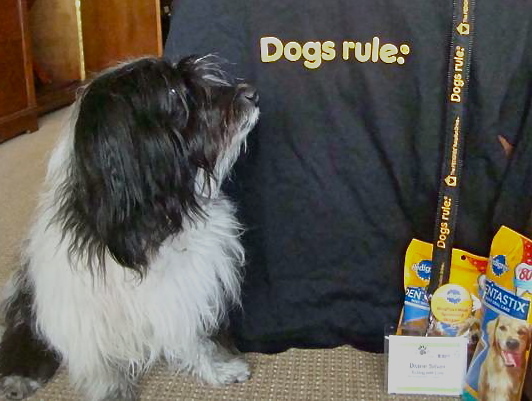 Just use the promo code BlogPaws10 through September 30 to get a 10 percent discount. AND, it's never too early to start buying holiday gifts, so here's a way to pick up a little something for the dog lover in your family. AND any time you purchase, a portion of proceeds go to the Pedigree Foundation to help shelter dogs who need it most. So everyone wins! And now, we bring you this message from Betty White, who we also LOVE in Hot in Cleveland! #BettyWhiteRules #BloggersRule #DogsRule! That's a lot of food. So pleased companies are helping like that. That's pawsome! Thanks for posting that! That is really awesome. Write a Post and Help a Dog campaign is an amazing way to help dogs. Thank you for sharing this information. Its a wonderful campaign to help dogs.